Everyone loves taking photographs – regardless of the device they are using for this purpose. So iPad is also being used by people for capturing photos and then editing them to spice them up a bit. Its large screen can act like a great view finder and thanks to its two, front and back, cameras you can capture some really good shots. To ameliorate capturing and editing photos, a plethora of photography related apps are present out there, but finding the best ones is not an easy task. 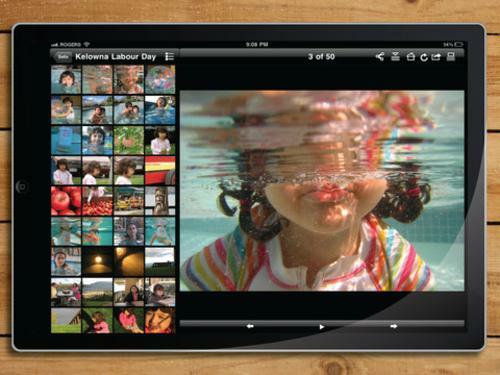 We have a list of 8 Best iPad 3 Apps For Photography. Some of these apps are paid while others are free of cost, but they all are amazing. So check them out and pick the ones that suit your needs the best. Web Albums is an awesome app with a super user-friendly layout that allows viewing, uploading, and managing your pictures on Picasa. It provides quick and easy access to your Picasa library. This app is also compatible with Google+ albums. It has the ability of streaming your photos and videos to your Apple TV from your iPad via AirPlay. Photogene is one of the best photo editing app for iPad. It is a comprehensive photo editing tool and allows cropping, straightening, color adjustments (including histogram and curves), sharpening and denoising, and retouching (dodge/burn, heal, localized effects etc). It is also a powerful collage maker. It also allows exporting multiple files to Flickr, Dropbox, Facebook, Twitter, Picasa, FTP and e-mail. Photobucket for iPad is a great app from Photobucket.com that allows uploading or downloadig media directly from or to your iPad to or from your Photobucket albums. You can also search Photobucket’s huge media repository and browse Find Stuff categories and search results. It gives you easy access to image URLs and lets you manage your Photobucket albums. 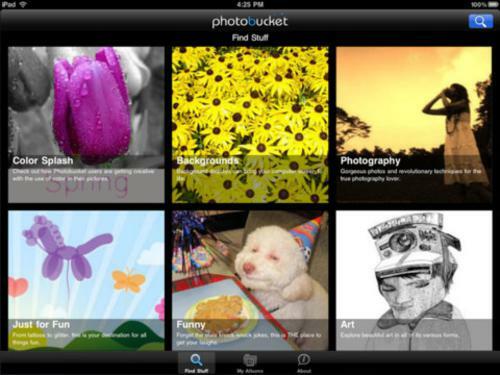 This amazing app brings Flickr photo sharing to the iPad. It allows browsing, uploading and editing your photos’ metadata in Flickr. You can also view group photos, videos and discussions by this app, and browse via user’s Streams, Sets, Collections, Groups, Tags and Galleries. It is a really comprehensive app for Flickr. 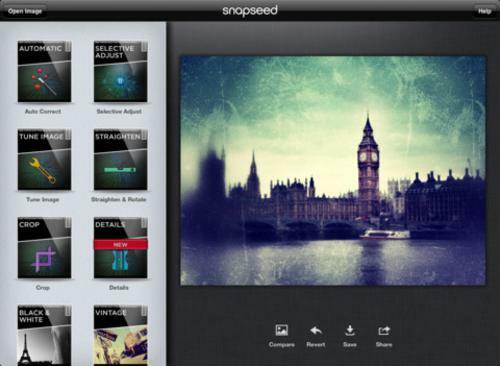 Snapseed is a fabulous app for every photography lover. It allows enhancing, transforming, and sharing your photos quickly and easily. It boasts many amazing features like auto correcting, selective correcting, tuning images, straightening and rotating images, cropping and adding various effects. It also makes sharing easy as you can share your images on Facebook, Flickr, Twitter (using iOS5), Instagram or via email. The Guardian Eyewitness is an app by Guardian News and Media Limited. This app showcases world’s most distinctive and provocative images, providing you a daily view of the global events. 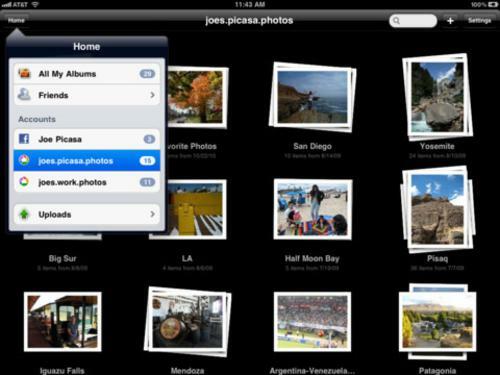 It also has the ability of saving images as favorites and sharing them through email, Twitter and Facebook. Adobe is a household name in photo editing world. Adobe Photoshop Express is an app that allows quick editing and sharing photo. It allows basic photo editing like cropping, straightening, rotating, flipping and adding effects and different filters. iPhoto is a great app from Apple that brings Multi-Touch to photography in a great way. It allows browsing, editing, and sharing your photos. You can edit photos by cropping, straightening, retouching images and adding professional-quality effects using this app. Enhancing images by adding various effects is also possible. You can also share photos to Facebook, Flickr, and Twitter.